I have seen a lot of people on facebook and other avenues asking about Color Oops and other Hair Dye Removers. So I am addressing that issue right here, because it's a big one! I am going to tell you two stories now about clients that I have had come into the salon that had used Color Oops. Client 1: This woman had blonde hair, and had dyed it a chocolate brown. She didn't buy Color Oops, but she did buy a "high end" hair dye remover at a beauty supply store. She thought that using a Color Stripper would be a healthier alternative to bleaching her hair. 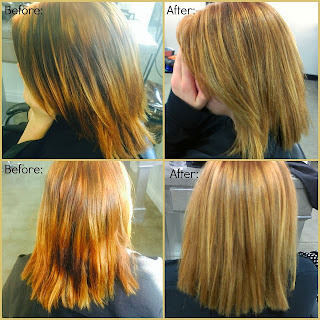 She used it and felt like it got rid of almost all of the brown in her hair. She then went to dye her hair a light brown color, and all of the chocolate brown came out immediately! She came to me with damaged and dry hair, and this sad tale. She told me she just wanted me to "strip the color out" but any licensed professional knows that that is not how hair color works. I was able to help her regain her beautiful blonde locks (she had decided not to go back to brown) but her hair was in a distressed state, and it took a while (and a lot of deep conditioning treatments) to get it back to a healthy state. One of the ways I find ideas of what to write on this blog is by going on Yahoo!Answers. I can not even tell you how many girls on there complain about this happening to them. They "strip" away a hair dye, and it works until they try to put dye over it, and then it's a disaster. The two pictures on the left are after using the color oops remover. The two on the right are after I professionally colored it. Client 2: This young lady had light brown-ginger hair naturally. She dyed it black, and then she bought Color Oops. She used one round of it, and her hair turned out like this (the two on the left are before we dyed her hair). Her hair had become coppery and brassy with huge chunks and stripes of black through out it! Plus those edgy choppy layers you see in the before pictures, were actually where her hair broke off! After one round of Color Oops! We decided to bring her back to a warm light brown with ginger undertones to help blend in the warmth exposed by the dye remover and to blend it in with her natural. I also tried to blend the layers as best I could. But ther damage was done, and although I tried really hard to salvage her hair, we both agreed that it would take a lot of deep conditioning and professional product to regain the hair's health. So what is the moral of these two stories? 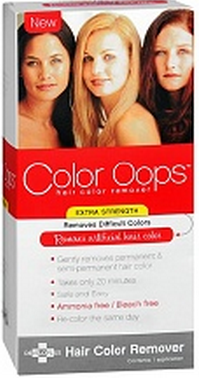 Don't use Color Oops or other hair dye "removers". They don't work, they damage your hair, and they aren't worth it. If you must get rid of a hair color you can either, go to a salon, go to a hair school (where they have trained girls who know what they are doing, but it costs less than a real salon), or wait for it to grow out. On that note I also urge you not to use box dyes on your hair either. Here is a link to my post called Why Is Box Dye So Bad For Your Hair? and it explains exactly what you are putting on your hair, and how it is different form what a professional uses.